If you’re a beer lover, you know the importance of hops. Home beer brewers need a ready supply of the perennial vine, but it also makes an attractive trellis or arbor covering. 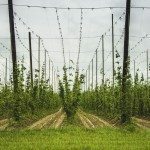 Hops grow from a perennial crown and cuttings are made from the bines or shoots. Hops plants are hardy in USDA growing zones 3 to 8. Keeping the crown alive during the cold months requires a little protection. Winterizing hops plants is easy and fast but the small effort will protect the roots and crown and ensure new sprouts in spring. Once you understand how to winter over hop plants, these attractive and useful vines can be yours to use and enjoy for season after season. Once temperatures get below freezing, hops plant leaves fall off and the vine dies back. In temperate zones, the roots and crown rarely receive a lethal freeze, but it’s best to be safe and protect the growth zone during the cold season. This is especially important where freezes are sustained and the winter is long. With proper preparation, growing hops in winter are hardy to minus -20 F. (-20 C.) and will regrow in spring. 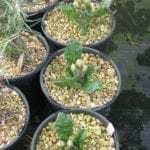 The new sprouts in spring are very sensitive to frost, however, and can be killed if frozen overnight. Therefore, hops winter care should extend into spring in case of late cold snaps. Hops have a taproot that can extend 15 feet into the ground. This part of the plant isn’t threatened by cold weather, but the peripheral feeder roots and crown of the vine can be killed. The top roots are only 8 to 12 inches below the surface of the soil. A heavy layer of organic mulch at least 5 inches thick helps protect the roots from freezes. You can also simply use a plastic tarp for winterizing hops plant when the greenery has died back. Before you mulch, cut the vines back to the crown. Wait until the first frost when you see the leaves dropping off so the plant can gather solar energy as long as possible to store in the roots for the next season. The vines tend to sprout easily, so don’t leave them to compost on the ground. If you want to start another generation of hops, place cut stems around the base of the plant and then cover with the mulch. Pull away the mulch when all danger of frost has passed. Not much activity is happening to growing hops in winter, as the plant is dormant. 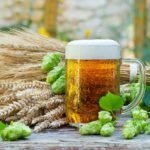 This easy method will help your hops plants overwinter and produce a delicious home brew.